The Atlantic Ocean is the second-largest ocean, covering approximately one-fifth of the Earth's surface. 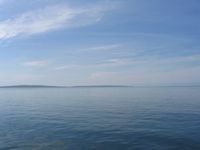 The ocean's name, derived from Greek mythology, means the "Sea of Atlas." The oldest known mention of this name is contained in The Histories of Herodotus around 450 BC (I 202). This ocean occupies an elongated, S-shaped basin extending in a north-south direction and is divided into the North Atlantic and South Atlantic by Equatorial Counter Currents at about 8° North latitude. Bounded by the Americas on the west and Europe and Africa on the east, the Atlantic is linked to the Pacific Ocean by the Arctic Ocean on the north and the Drake Passage on the south. A man-made connection between the Atlantic and Pacific is provided by the Panama Canal. On the east, the dividing line between the Atlantic and the Indian Ocean is the 20° East meridian, running south from Cape Agulhas to Antarctica. The Atlantic is separated from the Arctic by a line from Greenland to northwestern Iceland and then from northeastern Iceland to the southernmost tip of Spitsbergen and then to North Cape in northern Norway. Covering approximately 20% of Earth's surface, the Atlantic Ocean is second only to the Pacific in size. With its adjacent seas it occupies an area of about 106,400,000 square kilometres (41,100,000 sq mi); without them, it has an area of 82,400,000 square kilometres (31,800,000 sq mi). The land area that drains into the Atlantic is four times that of either the Pacific or Indian oceans. The volume of the Atlantic Ocean with its adjacent seas is 354,700,000 cubic kilometres (85,100,000 cu mi) and without them 323,600,000 cubic kilometres (77,640,000 cu mi). The average depths of the Atlantic, with its adjacent seas, is 3,338 metres (10,932 ft); without them it is 3,926 metres (12,881 ft). The greatest depth, 8,605 metres (28,232 ft), is in the Puerto Rico Trench. The width of the Atlantic varies from 2,848 kilometres (1,770 mi) between Brazil and Liberia to about 4,830 kilometres (3,000 mi) between the United States and northern Africa. 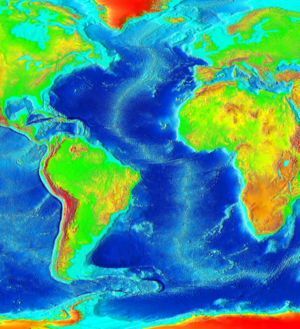 The principal feature of the bottom bathymetry ( terrain) of the Atlantic Ocean is a submarine mountain range called the Mid-Atlantic Ridge. It extends from Iceland in the north to approximately 58° South latitude, reaching a maximum width of about 1,600 kilometres (1,000 mi). A great rift valley also extends along the ridge over most of its length. The depth of water over the ridge is less than 2,700 m (8,900 ft) in most places, and several mountain peaks rise above the water and form islands. The South Atlantic Ocean has an additional submarine ridge, the Walvis Ridge. The Mid-Atlantic Ridge separates the Atlantic Ocean into two large troughs with depths averaging between 3,700 and 5,500 metres (12,000 and 18,000 ft). Transverse ridges running between the continents and the Mid-Atlantic Ridge divide the ocean floor into numerous basins. 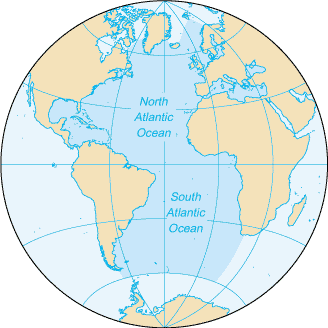 Some of the larger basins are the Guiana, North American, Cape Verde, and Canaries basins in the North Atlantic. The largest South Atlantic basins are the Angola, Cape, Argentina, and Brazil basins. Ocean sediments are composed of terrigenous, pelagic, and authigenic material. Terrigenous deposits consist of sand, mud, and rock particles formed by erosion, weathering, and volcanic activity on land and then washed to sea. These materials are found mostly on the continental shelves and are thickest off the mouths of large rivers or off desert coasts. Pelagic deposits, which contain the remains of organisms that sink to the ocean floor, include red clays and Globigerina, pteropod, and siliceous oozes. Covering most of the ocean floor and ranging in thickness from 60 to 3,300 metres (200 to 11,000 ft), they are thickest in the convergence belts and in the zones of upwelling. Authigenic deposits consist of such materials as manganese nodules. They occur where sedimentation proceeds slowly or where currents sort the deposits. The Atlantic Ocean as seen from the west coast of Ireland on a fair day. Surface water temperatures, which vary with latitude, current systems, and season and reflect the latitudinal distribution of solar energy, range from less than −2 ° C to 29 °C (28 ° F to 84 °F). Maximum temperatures occur north of the equator, and minimum values are found in the polar regions. In the middle latitudes, the area of maximum temperature variations, values may vary by 7 °C to 8 °C (13°F to 14°F). Within the North Atlantic, ocean currents isolate a large elongated body of water known as the Sargasso Sea, in which the salinity is noticeably higher than average. The Sargasso Sea contains large amounts of seaweed and is also the spawning ground for the European eel. Because of the Coriolis effect, water in the North Atlantic circulates in a clockwise direction, whereas water circulation in the South Atlantic is counter-clockwise. The south tides in the Atlantic Ocean are semi- diurnal; that is, two high tides occur during each 24 lunar hours. The tides are a general wave that moves from south to north. In latitudes above 40° North some east-west oscillation occurs. The climate of the Atlantic Ocean and adjacent land areas is influenced by the temperatures of the surface waters and water currents as well as the winds blowing across the waters. Because of the ocean's great capacity for retaining heat, maritime climates are moderate and free of extreme seasonal variations. Precipitation can be approximated from coastal weather data and air temperature from the water temperatures. The oceans are the major source of the atmospheric moisture that is obtained through evaporation. Climatic zones vary with latitude; the warmest climatic zones stretch across the Atlantic north of the equator. The coldest zones are in the high latitudes, with the coldest regions corresponding to the areas covered by sea ice. Ocean currents contribute to climatic control by transporting warm and cold waters to other regions. Adjacent land areas are affected by the winds that are cooled or warmed when blowing over these currents. The Gulf Stream, for example, warms the atmosphere of the British Isles and northwestern Europe, and the cold water currents contribute to heavy fog off the coast of northeastern Canada (the Grand Banks area) and the northwestern coast of Africa. In general, winds tend to transport moisture and warm or cool air over land areas. Hurricanes develop in the southern part of the North Atlantic Ocean. The Atlantic Ocean appears to be the second youngest of the world's oceans, after the Southern Ocean. Evidence indicates that it did not exist prior to 180 million years ago, when the continents that formed from the breakup of the ancestral supercontinent, Pangaea, were being rafted apart by the process of seafloor spreading. The Atlantic has been extensively explored since the earliest settlements were established along its shores. The Vikings, Portuguese, and Christopher Columbus were the most famous among its early explorers. After Columbus, European exploration rapidly accelerated, and many new trade routes were established. As a result, the Atlantic became and remains the major artery between Europe and the Americas (known as transatlantic trade). Numerous scientific explorations have been undertaken, including those by the German Meteor expedition, Columbia University's Lamont Geological Observatory, and the United States Navy Hydrographic Office. In 1858, the first transatlantic telegraph cable was laid by Cyrus Field. On April 14th 1912 the RMS Titanic sank after hitting an iceberg with loss of 1,593 people. In 1919, the American NC-4 became the first airplane to cross the Atlantic (though it made a couple of landings on islands along the way). In 1998, Ben Lecomte was the first person to swim across the Atlantic Ocean, stopping for only one week in the Azores. The surface is usually covered with sea ice in the Labrador Sea, Denmark Strait, and Baltic Sea from October to June. There is a clockwise warm-water gyre in the northern Atlantic, and a counter-clockwise warm-water gyre in the southern Atlantic. The ocean floor is dominated by the Mid-Atlantic Ridge, a rugged north-south centerline for the entire Atlantic basin, first discovered by the Challenger Expedition. The Atlantic Ocean has irregular coasts indented by numerous bays, gulfs, and seas. These include the Caribbean Sea, Gulf of Mexico, Gulf of St. Lawrence, Mediterranean Sea, Black Sea, English Channel , North Sea, Labrador Sea, Baltic Sea , Gulf of Maine , Bay of Fundy and Norwegian- Greenland Sea. Islands in the Atlantic Ocean include Faroe Islands, Greenland, Iceland, Rockall, Great Britain, Ireland, Fernando de Noronha, the Azores, the Madeira Islands, the Canaries, the Cape Verde Islands, Sao Tome e Principe, Newfoundland, Bermuda, the West Indies, Ascension, St. Helena, Trindade, Martin Vaz, Tristan da Cunha, the Falkland Islands, and South Georgia Island. On June 7, 2006, Florida's wildlife commission voted to take the manatee off of the state's endangered species list. Some environmentalists worry that this could erode safeguards for the popular sea creature. Note: This list of ports and harbors is very short. For instance, Panama alone has 30 ports.